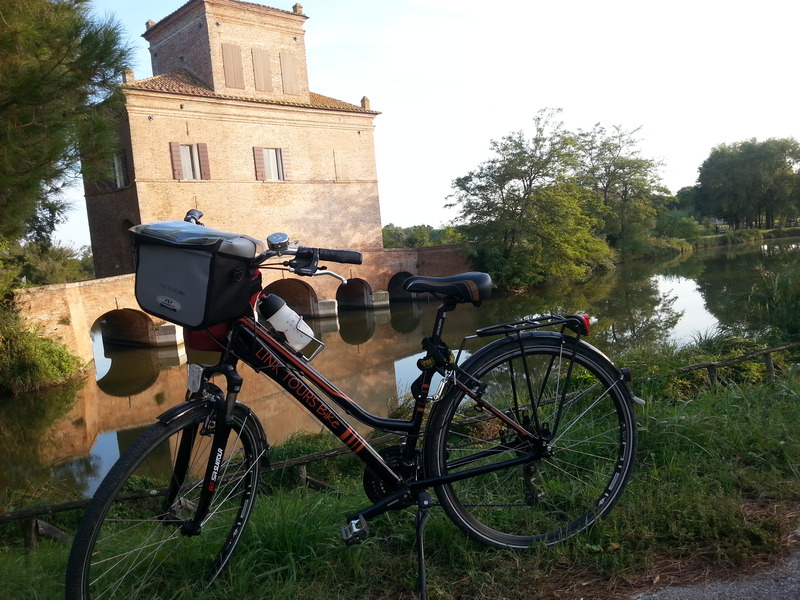 The route up to Comacchio is the same as the Venice-Lake Garda tour. After crossing the valleys of Comacchio with its pink flamingos, you will cycle through the typical maritime pine forests until you reach Ravenna, the capital of Byzantine mosaics. 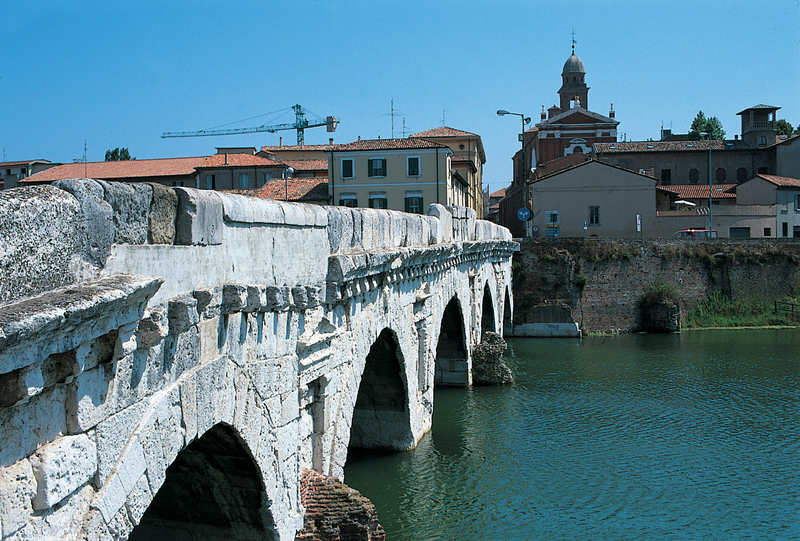 The tour then continues to Cervia, famous for its salt pans until arriving in Rimini, land of Malatesta and piadina! Breakfast at the hotel. 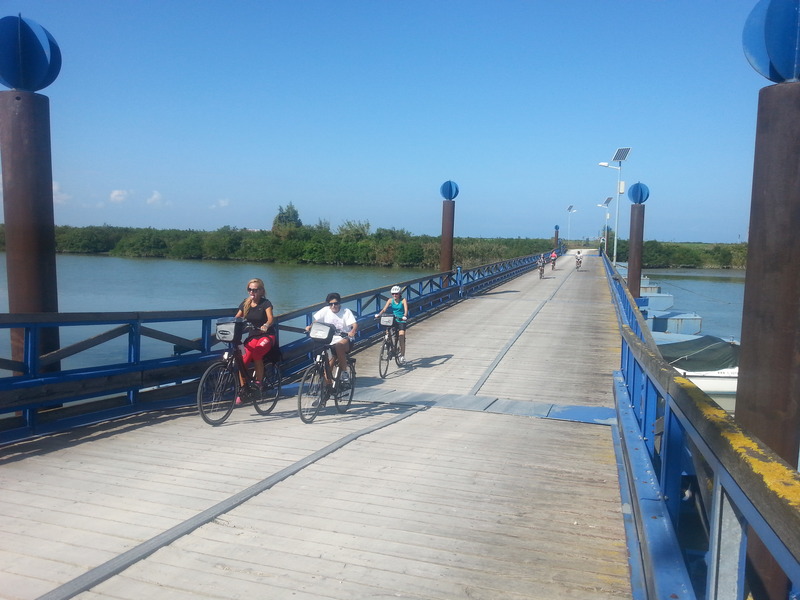 Following the newly created cycle path, you will arrive in Venice crossing over the Liberty Bridge. Once you reach the Tronchetto Pier you will board the Vaporetto to the Lido of Venice, also known as Isola d’Oro by the Venetians and its inhabitants. A fascinating past that has left the island with a vocation for tourism, with a reserved and elegant character that manifests itself through magical and Art Nouveau villas. The Lido also reserves other surprises, such as the ancient monastery of San Nicolò, a historical and monumental heart of the island and the village of Malomocco, a smaller Venice with streets, squares, and houses leaning against each other. You will then travel on to Pellestrina by ferry. Pellestrina is an island in the Venetian Lagoon and is the southernmost of the three narrow coasts that divide the lagoon from the Adriatic Sea. Thirteen kilometers long, with streets and squares, rivalry of neighbourhoods and a passion for regattas, the island of Pellestrina is a miniature version of the true and popular Venice. It’s a small world where you feel that you step back in time, the pace is slow with the eternal ritual of “ciacole” (people spending time chatting)ever present. With the colourful facades of the houses, no more than two or three floors high and all facing the lagoon, the Lego effect is guaranteed and makes Pellestrina appear an island-game. 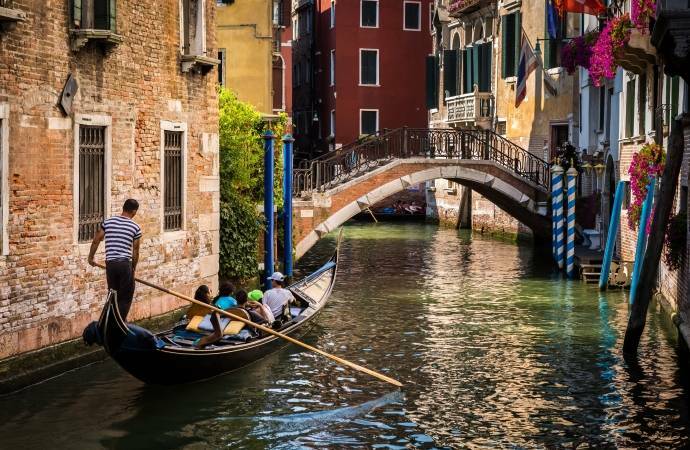 Here everything refers to the most popular Venice. From the sestieri, to the eternal ritual of spritz, the local aperitif, white wine sprinkled with Campari or Aperol. From the labyrinth of streets,sotoporteghi(archways) and campielli (neighbourhood squares)to the ciacolar (chit chat)of the fishermen who make comunella (socialise)in the Bar Perla. In addition to being an island of fishermen, Pellestrina is famous for the production of lace documented since the mid-fifteenth century. Even today, women embroider their lace and you have the chance to sit beside them and listen to their stories and traditions. Once you arrive at the southern end of the island, you will then board the vaporetto to Chioggia. Which will take you on to the hotel in the Chioggia Sottomarina area. Once there, you may have some free time to relax on the beach or to visit the charming lagoon town. Overnight stay at the Hotel. Breakfast in the hotel. Departure direction Po River Delta. You will ride along the canals and rivers. 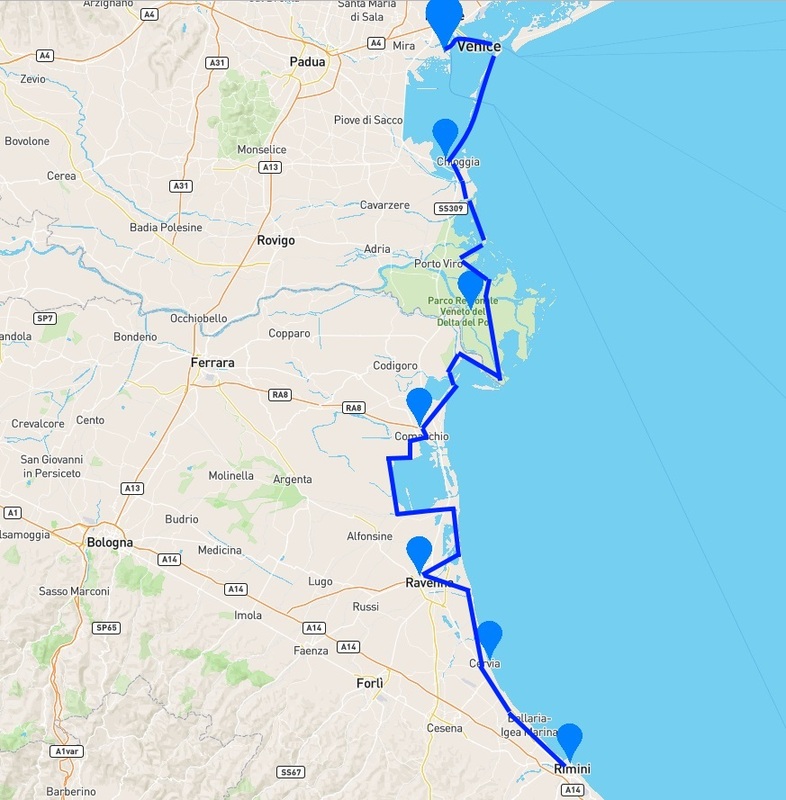 Once you have passed the part of the Po River of Venice, you will start to ride along the riverbanks, flood plains, valleys, and mirrors of water, where the salinity is regulated by operators. There are various species of birds: mallards, herons, Eurasian widgeons. You will then continue on a bike trail immersed within the Delta valley, a trail full of scenery that will take your breath away. Dinner and overnight stay in the Delta del Po area. Breakfast in the hotel. Morning departure for Comacchio, the so called “little Venice”. 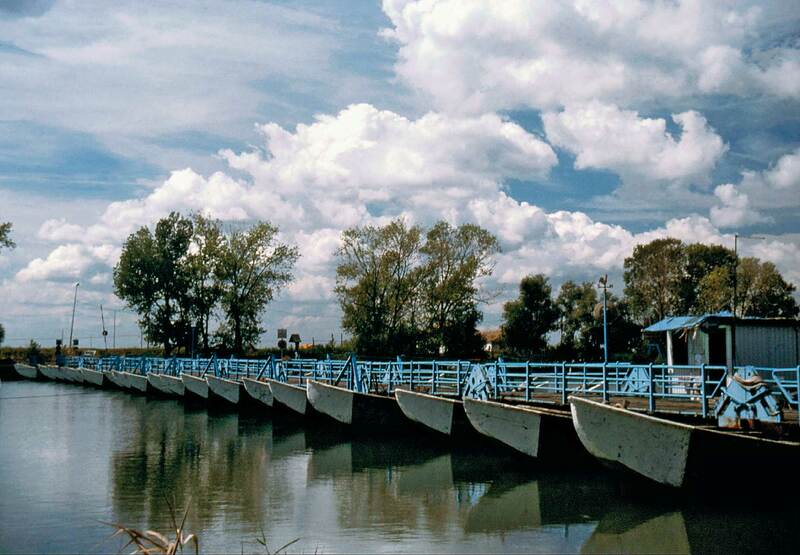 At Gorino, you will cross the boat bridge and then enter into the part of the Delta located in the Emilia Romagna region. You will surrounded by fabulous scenery which will unfold in front of your eyes, with the salt water creating a mirror effect. Its typical wooden huts of the fishermen placed on stilts and connected by bridges. 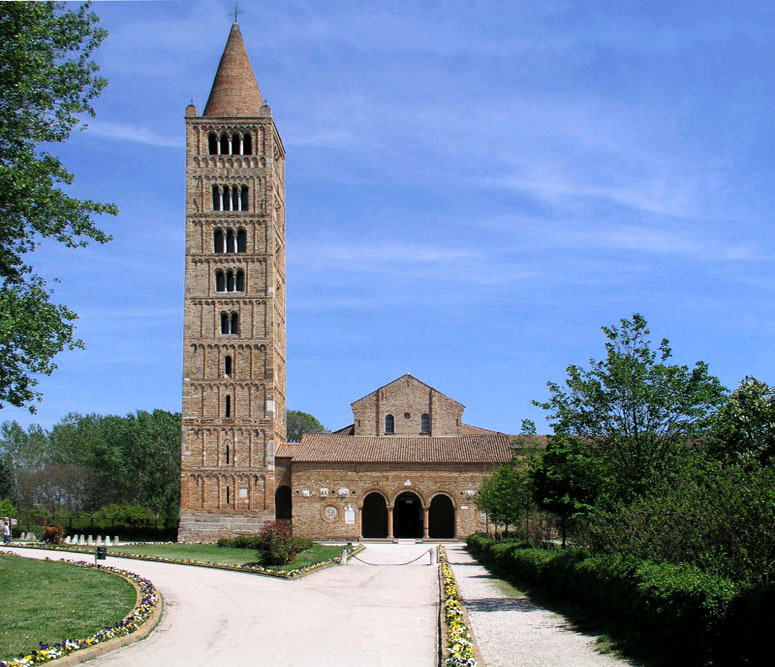 Once you have passed through the Mescola forest (where, with a little bit of luck, you can see deer and fallow deer) you will see the bell tower of the Benedictine complex of the abbey of Pomposa. Following the bike path which skirts the “Lago delle Nazioni,” so that you can pedal securely through beaches and pine trees. Last few kms lead to the town known for its famous Trepponti bridge. Free time to visit the “little Venice” with its bridges, canals, the historic fish farm, the Loggia of the tradesmen, the Loggiato of the Cappuccini, until you reach the Manifattura Marinati (Eel marinating museum) where you can immerge yourself in an ancient culture which is still practiced today, and learn the history of the local eel. Overnight stay in Comacchio. Breakfast in the hotel. Departure for the Comacchio Valleys: well-known throughout Italy as an important bird sanctuary, you will ride coasting along the Comacchio Valleys taking in their particular ‘bilancioni’ –bridged fishing huts- along the way until you reach the Agosta Banks. From here, you will pedal on a road that divides two waterways, on the one side the salt water Valleys, on the other, the fresh water of the Reno River. 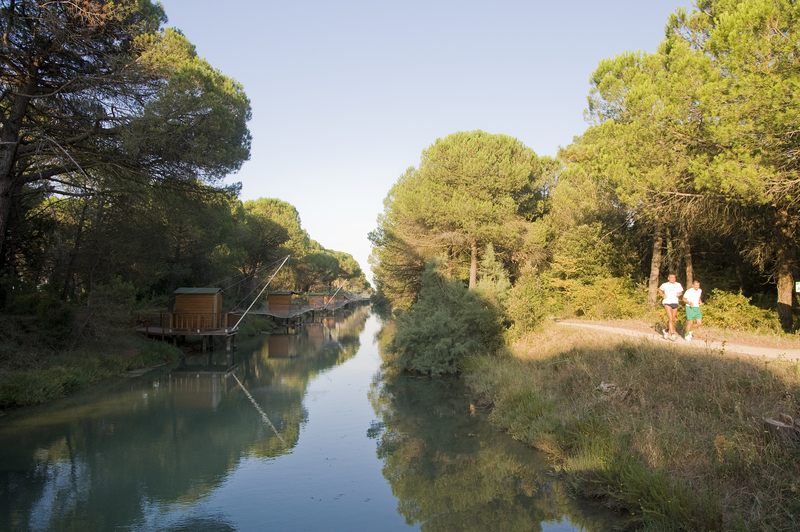 You will pass through Casalborsetti and arrive at the coastline through an ancient pine forest and lagoons, which will take you up to the town of Ravenna. 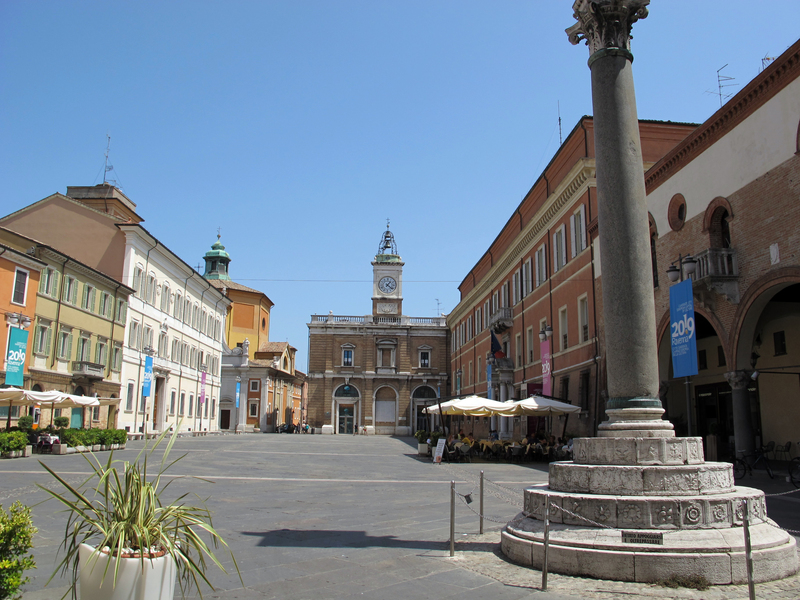 Free time in the afternoon to visit this extraordinary and famous Romagna Town. 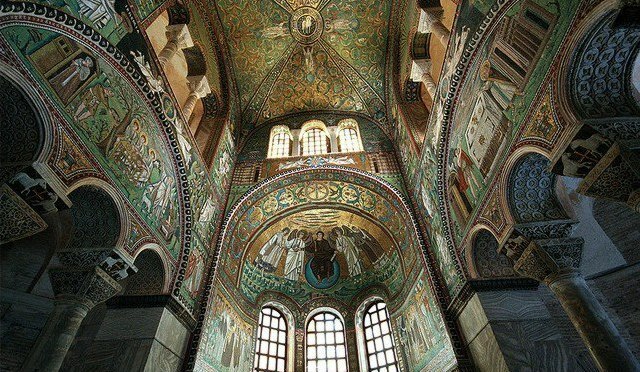 Make sure you take time to visit its Basilica ‘Sant’Apollinare Nuovo, Basilica of Saint Vitale, The Galla Placida Mausoleum, the Orthodox Baptistery, the Arian Baptistery, the Theodoric Mausoleum, the Basilica San’Apollinare in Classe and the Saint Andrea Chapel, all of which testify to Ravenna’s 5th Century Western Roman Empire history. Overnight stay in a hotel or B&B. Breakfast in the accommodation: Free Morning to finish off any sightseeing in Ravenna-there is so much to see! Departure in the early afternoon for Cervia. 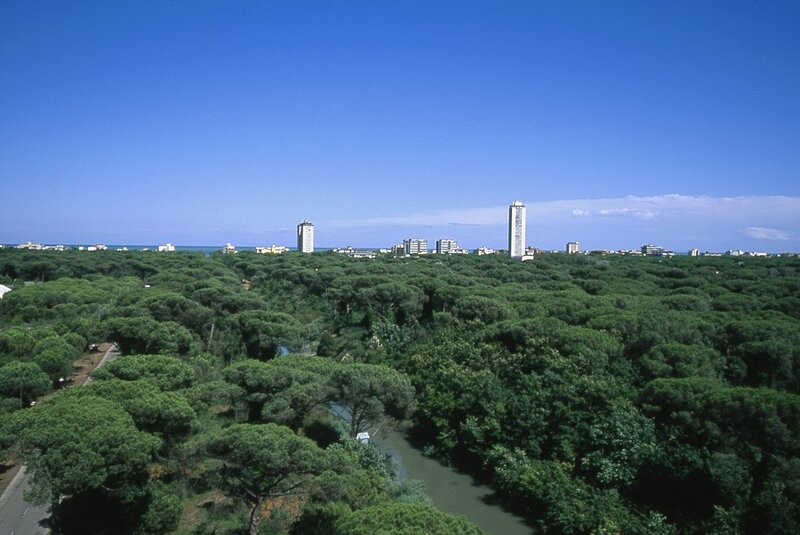 Riding through amazing pine forests with the delightful perfume of the maritime pine trees, you will arrive in Cervia. Overnight stay in a hotel. Breakfast in the hotel. Departure for Rimini. Today’s journey will take you pedalling along the Adriatic Coastline up to your arrival in Rimini. Rimini has been the favourite holiday destination for generations of holidaymakers for over 160 years. The secret to its success is the warmth of the people and the place, which welcomes visitors with open arms and invites them to visit its famous 15km of beaches and see its 230 brightly coloured beach resorts. 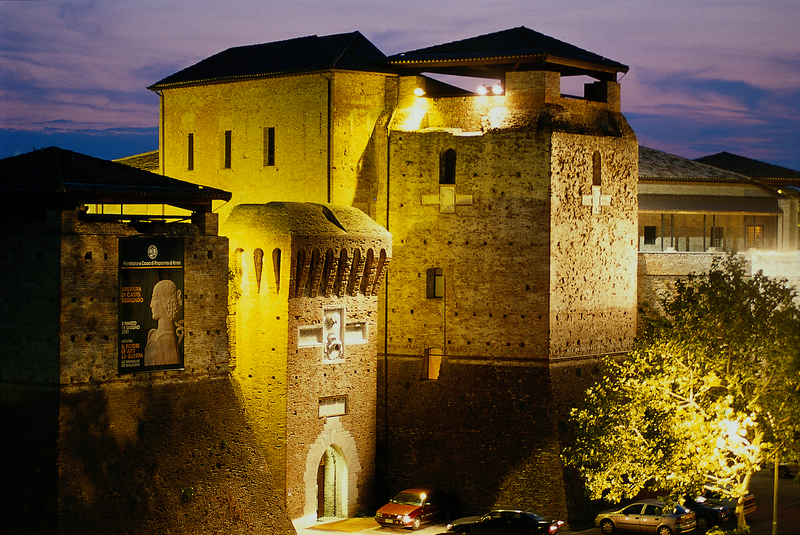 Free time to discover the treasures and artistic masterpieces that range from the Roman times to the Renaissance times, Rimini is a joy to visit. You can follow the trail and traces that 20 centuries of history have left upon it. The Augustus Archway, the Tiberius Bridge, Castel Sismondo, the Malatestiano Temple, the Three Martyrs Roman Square or the Mediaeval Cavour town square and to conclude your tour on a high note ,the City Museum which proudly attests its history through 1500 works and the archaeological site- ‘Domus del Chirurgo’ which proudly shows the still intact surgical-pharmaceutical equipment dating back to Roman Times. Train back to Venezia Mestre via Bologna.